The data is out about digital console revenue, and the demographics may surprise you. Unlike the mobile market which is fueled by middle aged women buying vanity items for their farms and lollipops for Candy Crush, the digital console market averages a much higher revenue per paying user. According to stats out of Super Data, digital console revenue got a boost of 26% in 2014, while the audience only increased by 9%. Despite all our rage about micro transactions, they are the most popular purchases among console spenders with weapons (55%), vanity items (36%) and vehicles (33%) at the top of the list of items purchased. Wait, where are the DLC? The average digital console spender is a 32 male (63%), with at least three years of tertiary education and an above average income. That said, women are starting to make a dent in the console gaming spending, grabbing 37% isn’t too shabby – could this mean that we’ll start seeing some male booth babes? I’m all for equal opportunity objectification. Most spenders purchase using micro transactions in FPS (24%) or action-adventure games (21%), with RPG gamers only accounting for 12% of those purchases. 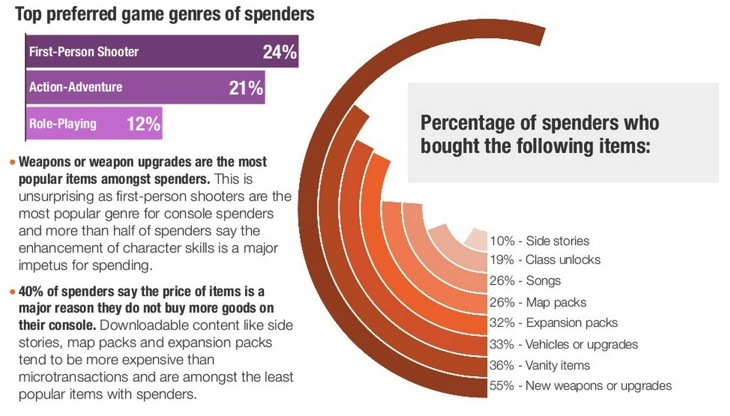 40% of spenders say high prices deter them from purchasing more – DLC like side missions, map packs and expansions are seen as more expensive than micro transactions and are the least popular items. Considering the growth in digital console spending, I think we can expect to see publishers pushing it even more. Want that cool weapon? No problem, it can be yours for the low, low price of some miscellaneous micro transaction in-game currency. I find it particularly interesting that FPS players are the ones buying all the stuff. I somehow imagined that gamers were spending money on extra story lines or missions, but no, it’s all about the weapons and vanity items.